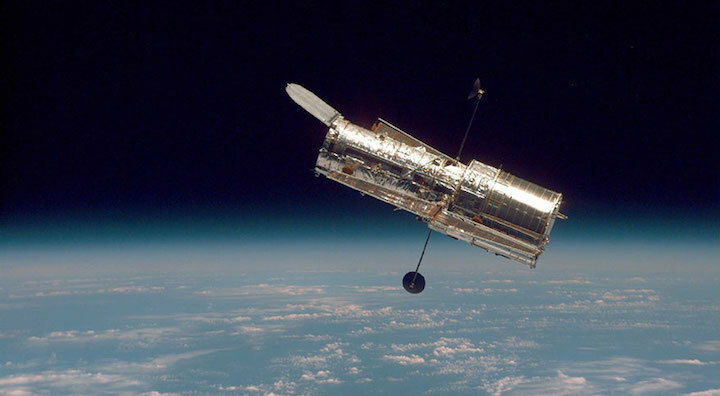 WASHINGTON — NASA’s venerable Hubble Space Telescope is in safe mode after the failure of one of its gyros and a problem with another, but the agency said this specific problem did not put the orbiting observatory in jeopardy. In a statement Oct. 8, NASA said the spacecraft went into a protective safe mode around 5 p.m. Eastern Oct. 5 after one of three gyros actively being used to orient the spacecraft malfunctioned. The safe mode means science observations with the spacecraft are interrupted while operators deal with the problem. Hubble is equipped with six gyros to precisely point the spacecraft, which were replaced in the final shuttle servicing mission in 2009. Two others have previously failed, most recently in April. All three are of a similar design, and NASA said it was not surprised that this third gyro failed. However, one of those three “technically enhanced” gyros is experiencing problems of its own. That gyro, which had been powered down, is not “performing at the level required for operations,” according to spacecraft telemetry after it was commanded to turn on. That issue is keeping the spacecraft from resuming normal operations using three gyros. NASA has convened an anomaly review board to investigate the issue with the enhanced gyro. “If the outcome of this investigation results in recovery of the malfunctioning gyro, Hubble will resume science operations in its standard three-gyro configuration,” the agency stated. Should engineers conclude that the enhanced gyro can’t be used, leaving only two, controllers plan to shift to an alternative mode that allows the spacecraft to operate with just a single gyro. That would permit one of the two gyros to be turned off, preserving its life until it’s needed when the other fails. “There isn’t much difference between 2- [gyros] and 1, and it buys lots of extra observing time,” tweeted Rachel Osten, the deputy mission head for Hubble at the Space Telescope Science Institute, late Oct. 7. That extended lifetime is something the astronomical community “wants desperately,” she added. While NASA says that reduced-gyro mode would have “relatively limited impact on the overall scientific capabilities,” some astronomers are concerned that the reduced-gyro mode could adversely affect some types of observations, such as of solar system objects, that require the precision of three-gyro operations. NASA didn’t disclose an anticipated schedule for resolving the gyro issue and resuming operations, either with one or three gyros. The current problem, though, is a reminder that, with the retirement of the shuttle, NASA currently lacks a means to repair or upgrade Hubble. Thus, each problem brings the telescope, one of the most famous and productive observatories in the history of astronomy, one step closer to its eventual end.